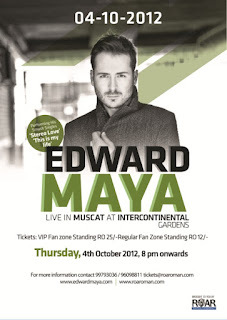 Home / Competitions / entertainment / gigs / Edward Maya in Muscat - Free tickets! 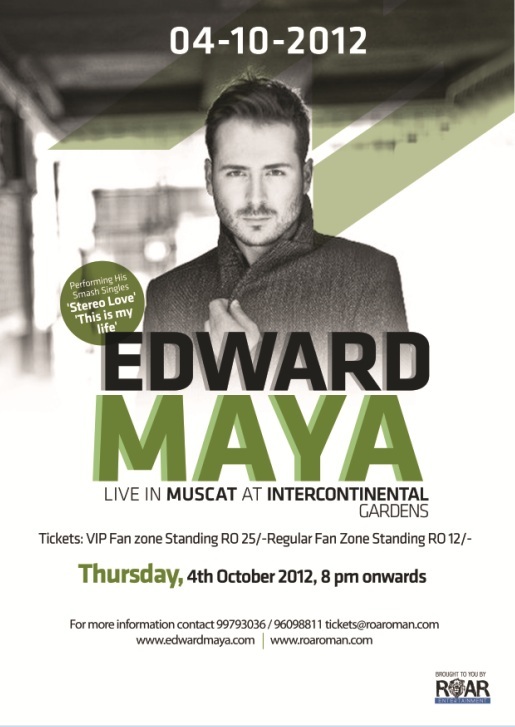 Edward Maya in Muscat - Free tickets! Seems like it's another week, another gig in Muscat these days. Roar Entertainment have signed up Edward Maya to come and entertain us all here on Thursday the 4th of October from 8pm onwards at the InterCon gardens. Edward Maya is a Romanian DJ who's had a few hit singles in the last few years and is still waiting to release his first album. Don't be turned off when I say DJ though - his act uses live vocals and instruments and is more of a band than a guy standing behind some decks. Tickets are RO 25 for VIP and RO 12 for regular access. Now, the lovely people at Roar Entertainment have given me 2 VIP tickets to give away to you readers of ze blog. All you need to do to be in the draw is to either leave a comment here, or send me an email with the subject "I want Edward Maya tickets" - thats it! Your entry will be assigned a number and your number will be put into my al fair bag full of raffle tickets! I want Edward Maya tickets. I want Edward Maya tickets Pls!! I want Edward Maya tickets!! Is this above 18? Or anyone can be there? I want Edward Maya tickets! Thanks for the amazing chance! I want Edward Maya tickets! want want want edward maya tickets so much! me me me please!!! give them to me...!! I want free Edward Maya tickets!!!! i want to disappear from my bosses for one eve...so Plz forgive me. I want Edward Maya tickets"
REALLLY BADLY ! Missed out on a chance to see him in Dubai, don't want to miss out again! Can I get the tickets?